Such Is The Kingdom Ministries, Inc.
We are called as a ministry to bring the Good News of Jesus Christ to the poor and needy of the world. We want to demonstrate the love of God through helps ministries and declare that Jesus is the Lord and Provider to those who have neither heard the Gospel nor seen it in action. 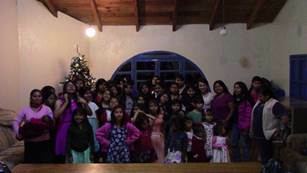 Our primary focus has been to minister to the physically and spiritually endangered children of Honduras. The name of our ministry, Such Is The Kingdom, appears in Matthew 19:14 where Jesus says, "Suffer little children, and forbid them not, to come unto me: for of such is the kingdom of heaven." This ministry lies on eighteen acres of land in the western Honduras mountains. The words Talitha Cumi are Hebrew for "rise up little girl". This is our basic theme for the girl's home. Our desire is to raise up young girls in their own country and culture; teaching them Christian values by evangelizing and discipling them. Our goal is to train and equip them for ministry using their spiritual gifts and talents throughout the nation of Honduras. In keeping with this goal, our desire is to educate the girls in their native language of Spanish to meet their domestic needs, and an English curriculum is taught to better prepare them for possible continuing education opportunities. Our desire is to provide a safe home atmosphere for the girls, whereby they will always have sisters, a family, and a place to call home. A medical clinic exists on the ministry property. Fully equipped offices are available for both physicians and dentists. The clinic assists with the physical needs of the local people, as well as serving as an evangelism tool to win the lost. The clinic serves as a base for medical and dental brigades from the United States to minister to the people of the area. The church network is a key part of the vision of the ministry. The goal is to train local pastors to evangelize and disciple the people of the community in their Christian walk. A church chapel building is located on the ministry property serving the girls and the local community. You may now make donations to the ministry by mailing to SIKM, P.O. Box 628, Doerun, GA 31744 or through PayPal. Simply click the button below. You may donate to SIKM by mailing to SIKM, P.O. Box 628, Doerun, GA 31744 or direct through PayPal by clicking the donate button below. Copyright ©sikm.org. All rights reserved.